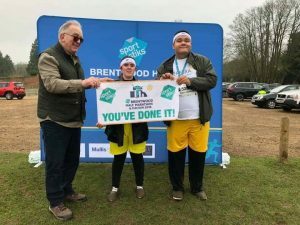 On 24th March our star volunteers Samuel Turner and Angel Jolly took part in the Brentwood Fun Run to raise funds for Cerebra. Samuel and Angel have done lots to help Cerebra since they first starting volunteering for us, from holding bake sales to placing our collection boxes in local businesses. But they decided they wanted to try a new challenge – that’s when they decided to take part in the Brentwood Fun Run. The event, part of the Brentwood Half Marathon, was originally meant to take place on 18th March but had to be postponed because of snow. Not to be deterred by the weather, Samuel and Angel finally managed to complete the race the following week. As well as raising money for Cerebra, the pair each had very personal reasons for rising to the challenge. Samuel was honouring his best friend who sadly passed away in 2009 and Angel was running for her brother Connor who has Cerebral Palsy. The pair have a Just Giving page through which you can show your support.